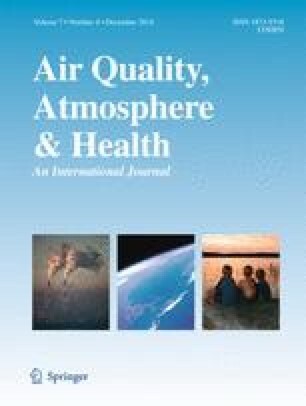 What is the impact of systematically missing exposure data on air pollution health effect estimates? Time-series studies reporting associations between daily air pollution and health use pollution data from monitoring stations that vary in the frequency of recording. Within the Air Pollution and Health: A European and North American Approach (APHENA) project, we evaluated the impact of systematically missing daily measurements on the estimated effects of PM10 and ozone on daily mortality. For four cities with complete time-series data, we created patterns of systematically missing exposure measurements by deleting observations. Poisson regression-derived city-specific estimates were combined to produce overall effect estimates. Analyses based on incomplete time series gave considerably lower pooled PM10 and ozone health effects compared to those from complete data. City-specific estimates were generally lower although more variable. Systematically missing exposure data for air pollutants appears to lead to underestimation of associated health effects. Our findings indicate that the use of evidence from studies with incomplete exposure data may underestimate the impact of air pollution and highlight the advantage of having complete daily data in time-series studies. D. Krewski also serves as Chief Risk Scientist for Risk Sciences International (www.risksciences.com), which has conducted air pollution risk assessments for public and private sector clients. APHENA core group: H.R. Anderson, R. Atkinson, R. Burnett, F. Dominici, K. Katsouyanni, D. Krewski, A. Le Tertre, S. Medina, R. Peng, T. Ramsey, J. Samet, E. Samoli, J. Schwartz, G. Touloumi, A. Zanobetti. Core group APHEA-2 data providers: H.E. Wichmann (Germany); J. Sunyer (Spain); MA. Vigotti, L. Bisanti, P. Michelozzi (Italy); D. Zmirou (Grenoble, France); J. Schouten (The Netherlands); J. Pekkanen (Finland); L. Clancy (Ireland); A. Goren (Israel); C. Schindler (Switzerland); B. Wojtyniak (Poland); B. Kriz (Prague, Czech Republic); A. Paldy (Hungary); E. Niciu (Romania); M. Macarol-Hitti (Slovenia); B. Forsberg (Sweden); F. Kotesovec (Teplice, Czech Republic); M. Pavlovic (Croatia). Research described in this article was conducted under contracts to the European Commission (EC) Climate Programme (contract number: QLK4-CT-2002-30226) and the Health Effects Institute (HEI, contract numbers: HEI 039–2 and 4737|RFPA98-6|05-11). HEI is an organization jointly funded by the US Environmental Protection Agency (EPA) (Assistance Agreement R82811201) and automotive manufacturers. The contents of this article do not necessarily reflect the views of HEI nor do they necessarily reflect the views and policies of the US Environmental Protection Agency (EPA) or of motor vehicle and engine manufacturers. Additional support was provided by a career award from the Natural Sciences and Engineering Research Council of Canada to D. Krewski.